With examples from runners like Geoffrey Kamworor who can win a local 1500m track race in Kenya and still manage to go ahead and run well in a very competitive 42km race within the same year, many runners in Kenya now believe that as long as you are in good shape for any distance in that range then you just have to survey the event that has a lesser competition and work towards making the national team in it. I was just having a chat with some track athletes here as they made plans for next year, and they have a believe that the most competitive event for Kenyan runners next year, on the men's side, will be the 1500m. With Elijah Managoi, Timothy Cheruiyot, Ronald Kwemoi and George Manangoi, it looks like to make the national team in this event for any other athlete in Kenya would be harder than in the other events. Perhaps runners in this event should consider moving up to the 5000m event or down to the 800m. Here are some of the Kenyan runners who dominated their distances in 2018 and are making other athletes to consider changing their events if they are to win major races next year. Eliud Kipchoge was completely in a class of his own in the men's marathon. He won the London marathon and the Berlin marathon. He also set what seems to be a permanent world record for the marathon having run 2:01:39 to win the Berlin Marathon. The previous record was being held by Dennis Kimetto at 2:02:57. Beatrice chepkoech ran an amazing time of 8:44.32 to set 3,000m steeplechase world record in Monaco in July. This was eight seconds faster than the previous world record held by Ruth Chebet of Bahrain. Chepkoech had such a great year in which she was seemingly unbeatable over the distance as she won the African title, the Intercontinental cup as well as some of the Diamond League races. Abraham Kiptum came seemingly out of nowhere to break one of the records that had stayed intact for quite some time. Kiptum ran 58:18 to set the new men's world record in the half marathon distance at the Valencia half marathon event in October. The previous record of 58:23 set by Tadese Zerseney had been standing since 2010. Timothy Cheruiyot and Elijah Manangoi, for the better part of 2018, shared the top two podium positions in the men's 1500m event whenever they raced together as though the event had been reserved for just the two of them. Cheruiyot would do well at the Diamond League races while Manangoi seemed to take the championship races. Three women ran dominantly in the marathon event. Brigid Kosgei won the Chicago marathon in 2:18:35 with her second half of the race being run in 68 minutes. Ruth Chepngetich dominated the women's race at the Istanbul marathon, coincidentally running a time of 2:18:35 as well, which is the seventh fastest time for women in history, despite running on the relatively tougher course. Mary Keitany, despite having struggled in the last stages due to an ambitious pace at the start of the London marathon that was eventually won by Vivian Cheruiyot, ran a spectacular race at the New York City Marathon to win it for a fourth time in 2:22:48. Conseslus Kipruto was another dominant runner in the men's 3000m steeplechase event, just like Helen Obiri was in the women's 5000m event. 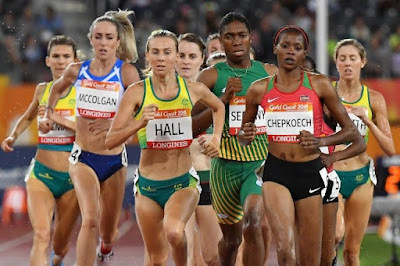 These will be some of the athletes to watch out for in the start lists this year, so one can pull out and look for another race if they are entered together, to better their chances of winning.